April shows Tom Hiddleston in Ben Wheatley's 'High-Rise'. May's is an illustration of Joan Crawford in 'Johnny Guitar' by Curt Merlo. 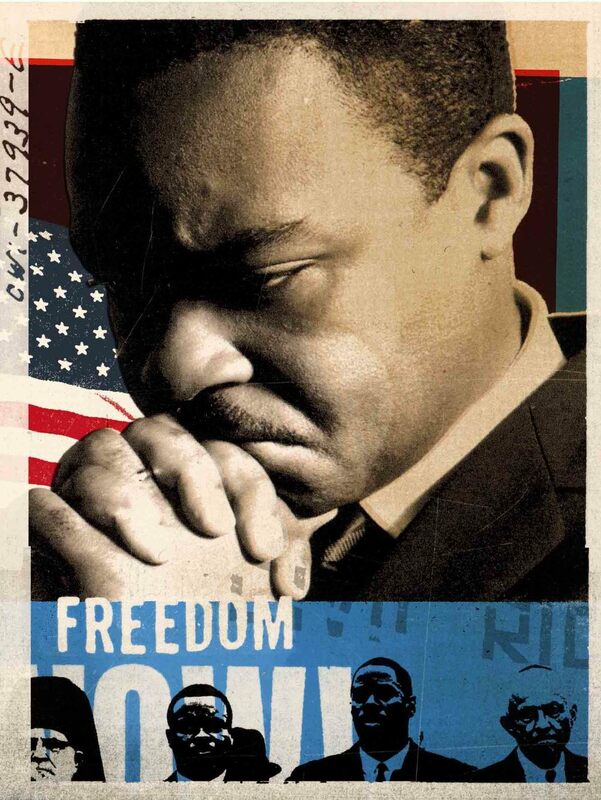 February features a photograph of Quentin Tarantino by Levon Biss. March shows an illustration of Charlie Kaufman by Jimmy Turrell. The December issue features Todd Haynes director of the Patricia Highsmith adaptation 'Carol'. In January we featured Leonardo Dicaprio star of Alejandro González Inárritu's 'The Revenant'. Just received copies of the Love book, which will accompany the forthcoming season at the BFI Southbank. Guillermo del Toro's Crimson Peak is an ornate, carnal gothic tale about a young American woman in the early 20th century looking to lay her childhood fears to rest. Photography by Allan Amato and lettering by Sarah J Coleman at Inkymole. 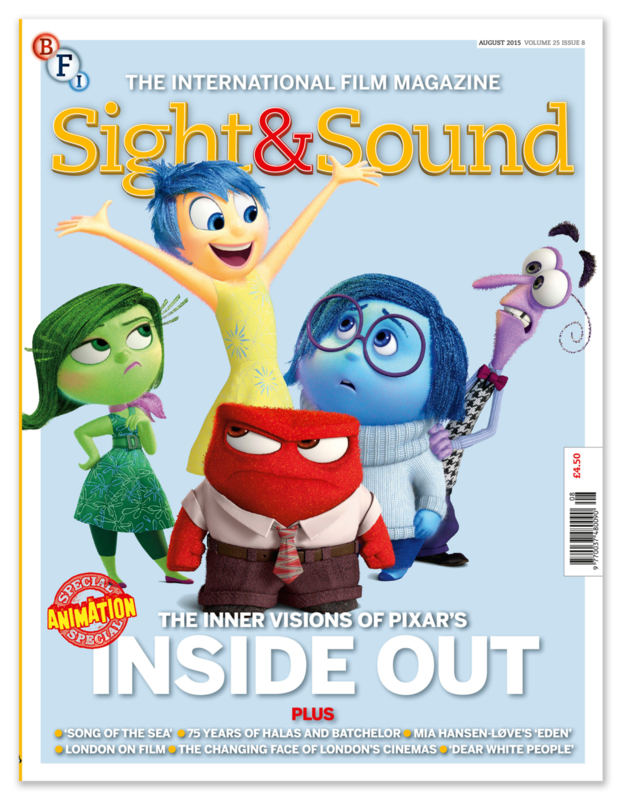 Here is a mini mag we've just produced to introduce Sight&Sound to students. Available at a freshers fair near you! For almost half a century the director, John Waters, has provided a beacon for the maladjusted and misunderstood – and been a bête noir for puritans. He features as our cover star on the September issue with cover type by Sarah J Coleman at Inkymole. In our October issue we celebrate a selection of remarkable works by female filmmakers that have unjustly slipped from public view – with choices by Jane Campion, Greta Gerwig, Claire Denis and Agnès Varda among others. The cover was illustrated by Lorenzo Petrantoni. Pete Docter's 'Inside Out', which explores a young girl's growing pains from the perspective of the animated emotions inside her mind, is a spellbinding return to form for Pixar Studios, offering a remarkably thorough exploration of the human psyche and a shrewd examination of the value of sadness in everyday life. This cover features an 'Animation Special' logo designed by Andy Smith. I've just printed an 8 page tabloid sampler of my work with the Newspaper Club. The June issue has a French Cinema Special which traces the growing visibility of ethnic-minority actors on French screens, a focus on the coming-of-age drama 'Girlhood'. Plus, features on François Ozon's 'The New Girlfriend' and Olivier Assayas' 'Clouds of Sils Maria'. In July, with all that has been written about Welles – born 100 years ago – it might feel as if there’s nothing new to say. But the restless polymath left such a vast body of work it’s still possible to find underappreciated gems – from his first professional film outing, 'Too Much Johnson', to a 1950s TV travelogue series to his late unfinished opus 'The Other Side of the Wind'. A recent trip to Wales has resulted on the following screen print. The cinema of the Southern Gothic is haunted by the ghosts of slavery, lost loves and dark family secrets, and set in a world characterised by macabre violence. This cover by Alex Williamson captures it brilliantly. Illustration for the April issue of Sight&Sound on director's cuts and alternate versions by Kate Gibb. 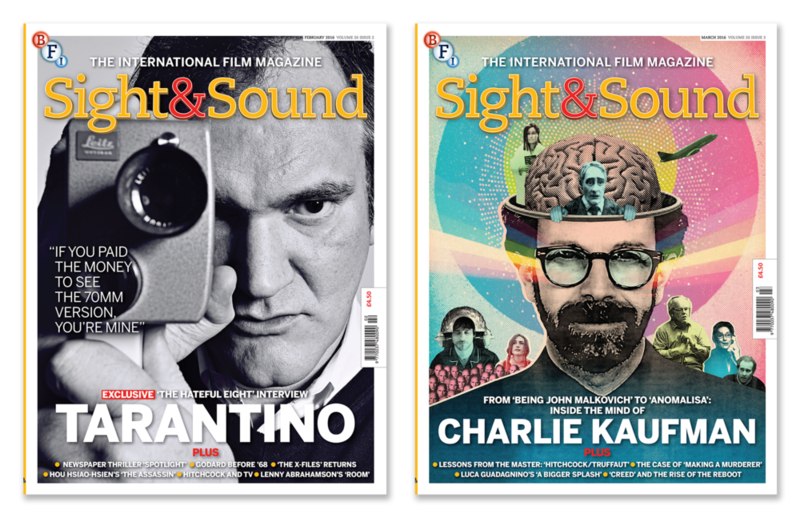 The April 2015 issue of Sight&Sound picks 50 of the most intriguing examples of films that exist in different versions due to director's cuts or because they have been dubbed or censored for television. In the September 2013 issue we had a television special looking at how 50 top-drawer directors, from Robert Altman to Orson Welles made their impact on the smaller screen. In both cases I needed to design a cover to reflect that this was not a standard issue. At Sight&Sound we believe in officialdom and rigidly adhere to regulations and bureaucracy. It is in this uplifting spirit that I have designed these stamps to help us in the rigorous process of getting the magazine to print with as few errors as possible. When I was at London College of Printing nearly twenty years ago, studying typography, one of the many elements of the course was screen printing. Since I left in 1999 I haven't screen printed. However, after recently working with Kate Gibb I've been inspired to start again and have set up an area in the loft at home. Here is my first effort. Here is an illustration I did for the RSA Journal. 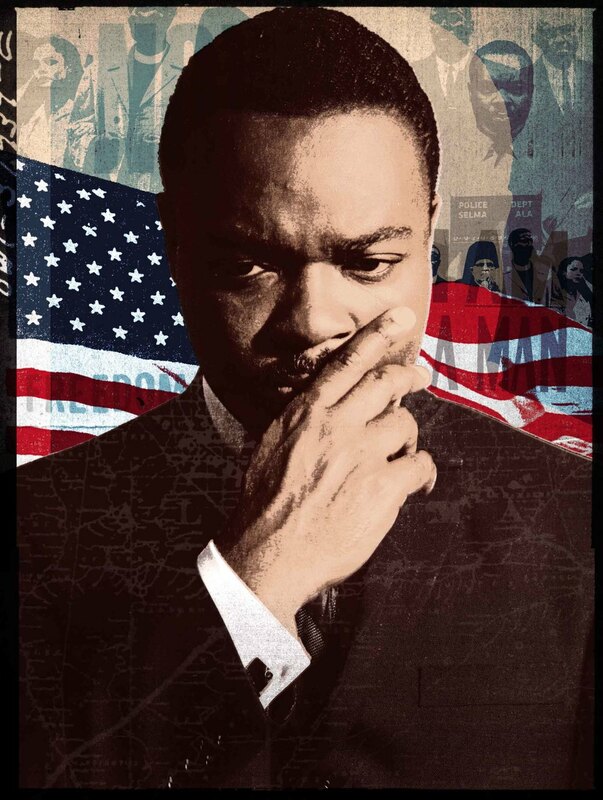 The feature was called 'Escaping the pack' and was about how a civil society must start meeting its potential and contribute fully to the public good. 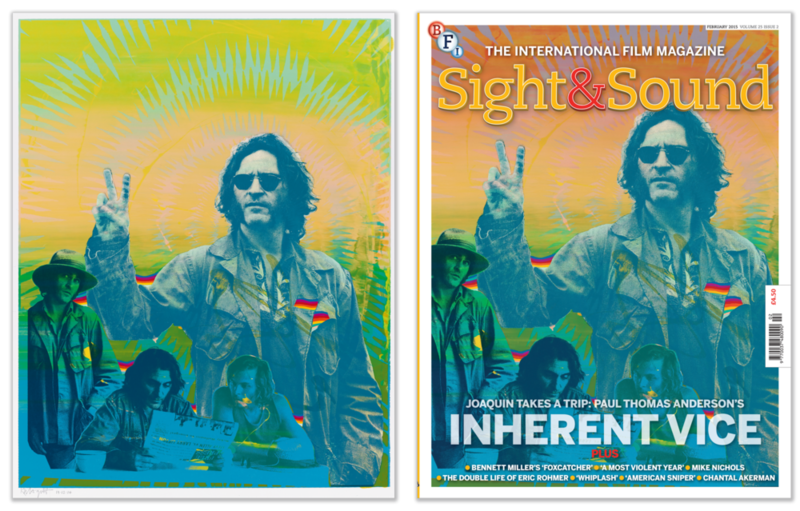 In Paul Thomas Anderson's adaptation of Thomas Pynchon's 'Inherent Vice', Joaquin Phoenix plays a stoner detective in a Californian hippie culture soured after the Manson Killings. Cover screen print by Kate Gibb.